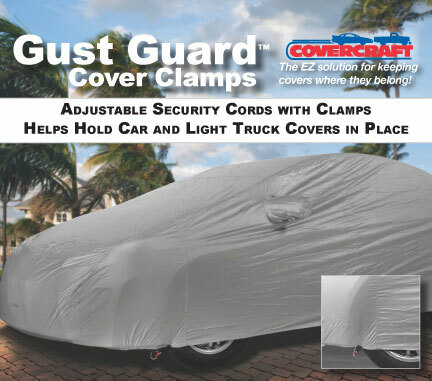 Gust Guard car cover clamps - Gust Guard car cover clamps secure car covers in storms, gusting wind, high wind and in any outdoor weather. They can also protect your BBQ, lawn furniture, bike, ATV or personal watercraft. Using the four Gust Guard clips you will be able to secure your car cover in a lasting way. By following the installation instructions, your car cover will stay where you put it, even when the wind blows. Car covers alone should NOT be used in high wind conditions, but sometimes you may need to car or truck covered for a extended period of time, such as in a airport, on vacation, etc. in locations where wind could be a problem. The Gust Guard car cover tie downs will help keep your car cover in place during these high winds, and are very easy to install. The Gust Guard kit includes parts to make two adjustable security cords that clamp to the car covers hem in front of the front tires and another behind the rear tires. When the wind gusts get under the car cover, the Gust Guard keeps the car cover on and reduces the possibility of the front and rear of the car cover ever coming loose. * Gust Guard can not be held responsible for improper or careless application.